If you want a real chance to catch fish, generally live bait is the answer. Why? Live bait is the natural food of fish. Fish are predators that take advantage of every opportunity that presents itself and a live shrimp dangling from a hook with no chance of escape makes a very tempting meal. Here you will find a page on how and when to catch shrimp with a cast net. It doesn't matter where you are fishing, in most cases natural bait is the best. Say for instance you are fishing in a small creek or the family pond and you are using earthworms, crickets or small minnows, I can just about guarantee you'll catch some bass and bream. In many estuaries in the south, finger mullet and mud minnows are the preferred bait. They are generally easy to spot and with the use of a cast net, easy to catch. Plus, they rate high on the list of meals for fish like redfish, flounder, and spotted sea trout. Float a shad, or crawfish at the end of a bobber and any number of species can be the reward. If you are fishing for a large redfish, black drum, or catfish, a body section of blue crab is hard to beat. 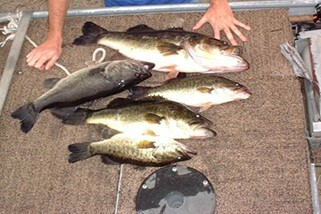 These bass where caught with only a half dozen golden shiners! The time spent catching fresh natural bait is time well spent. For example, using a torpedo shape minnow trap to catch dozens of blacktail shiners or crawfish, then keep them alive in a homemade bait bucket . Plus, it can be fun as well as satisfying. We feel so strongly about natural bait this whole section is dedicated to it. So take your time looking through this section and you'll get tips on how to catch, hook, and keep the bait alive.